FiSahara takes place in Dakhla, the most isolated of four camps, 130 miles from the nearest town and home to around 30,000 Saharawi refugees. There are no paved roads, no sources of water, no vegetation and in summer, temperatures can reach 50°C. 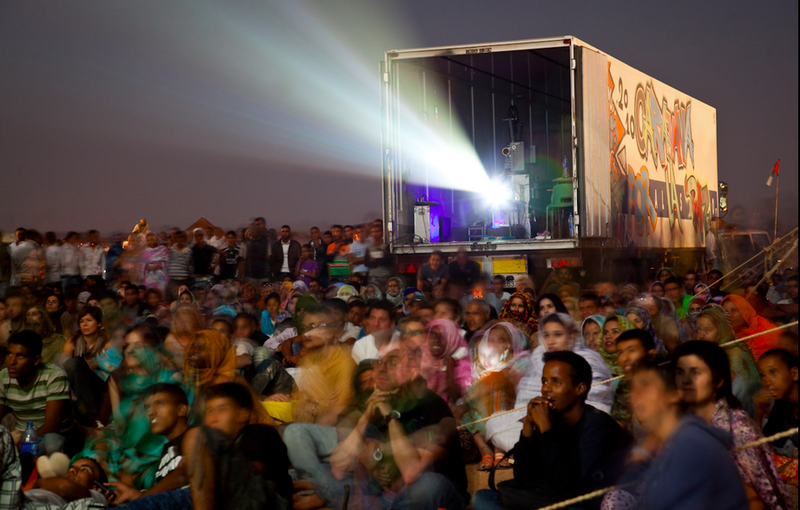 And yet once a year a multiplex-sized screen rolls up on the side of an articulated lorry, a tented village springs up in the centre of the camp and hundreds of actors, directors and film industry insiders fly in from around the world for a programme of more than 30 films, some made by the refugees themselves. This year, the festival will aim to reach out to an even wider audience in order to bring attention to the forsaken struggle of the Saharawi people. It also seeks to frame this struggle within the regional movement that has pushed millions of citizens of the Middle East and North Africa to demand freedom, justice and dignity since 2011. In fact, many find the root of the so-called Arab Spring in the Western Sahara, back in 2010, when the indigenous Saharawi population demonstrated against the occupying Moroccan authorities. Their demonstrations were violently put down, and eleven Saharawis were killed. Despite the increasing threats, violence and suffering the region faces, the struggle against oppression that was at the core of the 2011 mobilizations remains, more than ever, a legitimate one. Creating and fostering bonds and networks between civil activists in the Sahara, Palestine, Syria, Egypt, Tunisia and the rest of the MENA region is crucial to strengthen citizen voices against tyranny, whether this comes from fascist and so-called secular regimes or islamist threats. Many journalists, activists and movie makers from the region will join this festival´s edition. We are very proud of all of them, but there is one who is particularly inspiring. This festival is particularly meaningful for me to go to because I have had enough of self-censoring myself on the Western Sahara issue. The refugees I will be working with are refugees because my country, Morocco, is occupying their land. This is why it is particularly symbolic that I am working with Guy Davidi, an Israeli who supports the Palestinian cause. I always hope more Israelis take action to support Palestinians, but how can I not expect the same from myself regarding Western Saharans? It’s almost the same issue: an occupier and an occupied, a settler-population and a refugee population… I was brainwashed for years to believe the Western Sahara was Moroccan, but says who? King Hassan II? Our state-owned TV channels? Our government-controlled history textbooks?